How many years will I live in the Student Living Center? First-Years, Sophomores, and Juniors are guaranteed housing in the SLC all three years. Additionally, the Office for Residential Life reserves spaces for seniors and graduate students who choose to live with us beyond their commitments. If you are interested in living in the Student Living Center and meet the eligibility, please contact reslife@esm.rochester.edu by June 1st. Can I stay in the Student Living Center over breaks? The Student Living Center remains open during all breaks, except for winter break and summer break. Residents are not permitted to stay in the building during either of these breaks. Residents will not be given permission to stay in the Student Living Center during breaks based on travel plans. Please plan accordingly based on the dates listed on the Residential Life website. Where can I exercise in the Student Living Center? The Student Living Center does not have any exercise facilities. Eastman students, however, are invited to use the University of Rochester fitness facilities located on the River Campus. The Carlson MetroCenter YMCA is also located right next to the Student Living Center, and offers a discounted rate for students. What if I am interested in living off-campus? If you are not required to live in the Student Living Center, you may look for apartments in the area. The Office for Residential Life maintains an off-campus housing database that can be a resource for students looking for housing. Where can I report issues? What safety precautions are taken in the SLC? The SLC has a sprinkler system and updated fire prevention/warning systems. Furthermore, the SLC is equipped with the necessary safety and security hardware such as smoke detectors and alarm systems, all building access to student rooms are kept locked, and each student is issued an Eastman Identification Card (ID) which activates the doors in the SLC. Room door keys are issued to each resident. All residents must present a valid Eastman ID card upon entry and when asked by University officials, including front desk staff. All residents are encouraged to remain aware of their surroundings in the City of Rochester. A typical Eastman student walks quickly and focuses intently on crossing the street without distraction, looking both ways, and intent on getting to their destination. Additionally, Eastman students walk in well-lit sidewalks, avoid unfamiliar areas, and are encouraged to speak loud and clear about their comfort with strangers. How does the shuttle system to the University of Rochester work? The shuttle buses are open to anyone who holds a University of Rochester (Eastman included) ID card. The Red Line goes to/from Eastman to the River Campus throughout the day. There are other lines that make different stops in Rochester from the River Campus. Full bus schedules and destinations can be found here. The East End Parking Garage is located right next to the Eastman East Wing. There is a discount available to students. Yes. There is a bike room available in the basement of the Student Living Center. There is a $25/year storage fee, and spots are reserved on a first come, first served basis. Are there fun things to do in Rochester? 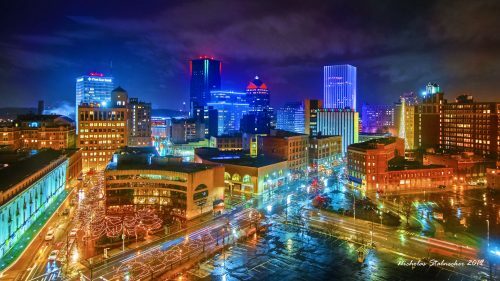 There are many fun things to do in Rochester! Information about places to visit in Rochester can be found at VisitRochester’s Website.